BURLINGTON (September 29, 2009) – Local artist Jason Bouwman is looking forward to seeing the new Special Edition Uncirculated coin set released by the Royal Canadian Mint last week. The principal of Burlington-based Compass Creative was commissioned to design the three coloured 25-cent coins contained in the set, celebrating Canada’s top three Olympic winter moments of all time, as voted on by fans across the country. Earlier this year, the Mint asked Canadians to vote on their favourite Olympic Winter Moments. Fifty-five top Canadian Olympic Winter Moments were whittled down to ten by a jury. From there, Canadians voted to select the top three. This set celebrates these favourite three Canadian moments. Twenty-two million of each three Moments coins will enter circulation starting at the end of September. BUT of those twenty-two million coins, only three million will be in colour – and each one will only be found, by chance, in random rolls distributed throughout this great nation. Mr. Bouwman’s work has appeared on several collector coins in recent years but these will be the first circulation coins to be designed by him. 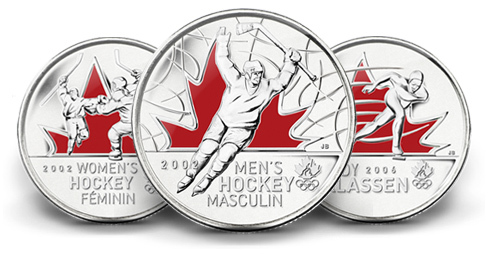 For more information on where to purchase the Special Edition Uncirculated Set – Olympic Moments please visit www.mint.ca.